…In November 2012, total seasonally adjusted building approvals increased in only one jurisdiction, Victoria – up by 8.7 per cent. Approvals fell in South Australia (-13.8 per cent), Tasmania (-7.6 per cent), New South Wales (-4.0 per cent), Queensland (-1.5 per cent) and Western Australia (-1.0 per cent). In trend terms building approvals in November fell in both the Australian Capital Territory (-0.8 per cent) and the Northern Territory (-3.6 per cent). 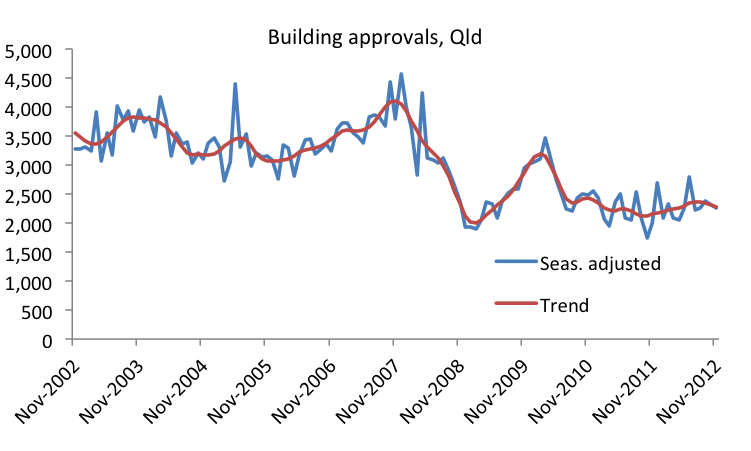 Building approvals up but Qld slips again from Conus Economics Blog. This entry was posted in Housing and tagged abs, buildingapprovals, buildingindustry, construction, fourpillars, hia, queensland. Bookmark the permalink.